Updated Wednesday November 29, 2017 by THOMASTON LITTLE LEAGUE. 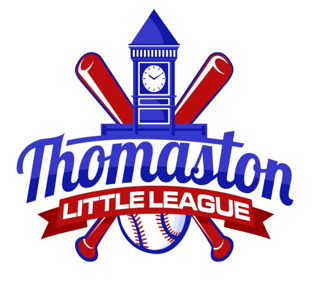 Thomaston Little League provides spring baseball and softball for more than 180 boys and girls between the ages of 4 and 13. We are very excited to begin this upcoming 2018 season with all of our current players as well as all the new families coming into the league for their first time this year! Thomaston Little League depends on a tremendous amount of support from our local community to be successful. Without the generous contributions of our volunteers, private individuals and business sponsorships Thomaston Little League would not be a possibility. We are deeply grateful for our community whose support has made Thomaston Little League such a great experience for our children and their families for 67 years! As we prepare for the beginning of another fun baseball season, we hope you will join us as part of our sponsorship community. Your tax-deductible donation helps us offset the costs of equipment, uniforms, maintenance expenses, training materials and all the associated costs of conducting our league. Your contributions also help keep the signup costs down for our families. We have some new sponsorship options this year that we think will help your business and will keep your business name at the front of all of our families and spectators throughout the season. Please see attached flier for this year’s sponsorship options. All donations are tax deductible. If you have any questions, please contact Tanya Galpin at 860-601-5641. Because of your generous support, our children will have a rewarding and memorable Little League experience in 2018. From our families, volunteers and especially from our young players …..thank you!